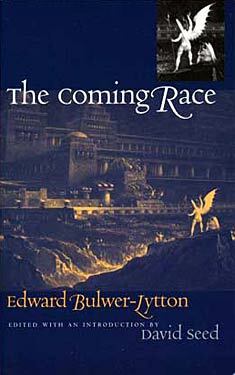 If you liked The Coming Race you might like these books. I am a native of __________, in the United States of America. My ancestors migrated from England in the reign of Charles II. ; and my grandfather was not undistinguished in the War of Independence. My family, therefore, enjoyed a somewhat high social position in right of birth; and being also opulent, they were considered disqualified for the public service. My father once ran for Congress, but was signally defeated by his tailor. After that event he interfered little in politics, and lived much in his library. I was the eldest of three sons, and sent at the age of sixteen to the old country, partly to complete my literary education, partly to commence my commercial training in a mercantile firm at Liverpool. My father died shortly after I was twenty-one; and being left well off, and having a taste for travel and adventure, I resigned, for a time, all pursuit of the almighty dollar, and became a desultory wanderer over the face of the earth. In the year 18__, happening to be in __________, I was invited by a professional engineer, with whom I had made acquaintance, to visit the recesses of the __________ mine, upon which he was employed. The reader will understand, ere he close this narrative, my reason for concealing all clue to the district of which I write, and will perhaps thank me for refraining from any description that may tend to its discovery. Let me say, then, as briefly as possible, that I accompanied the engineer into the interior of the mine, and became so strangely fascinated by its gloomy wonders, and so interested in my friend's explorations, that I prolonged my stay in the neighbourhood, and descended daily, for some weeks, into the vaults and galleries hollowed by nature and art beneath the surface of the earth. The engineer was persuaded that far richer deposits of mineral wealth than had yet been detected, would be found in a new shaft that had been commenced under his operations. In piercing this shaft we came one day upon a chasm jagged and seemingly charred at the sides, as if burst asunder at some distant period by volcanic fires. Down this chasm my friend caused himself to be lowered in a 'cage,' having first tested the atmosphere by the safety-lamp. He remained nearly an hour in the abyss. When he returned he was very pale, and with an anxious, thoughtful expression of face, very different from its ordinary character, which was open, cheerful, and fearless. He said briefly that the descent appeared to him unsafe, and leading to no result; and, suspending further operations in the shaft, we returned to the more familiar parts of the mine. "Tell me frankly what you saw in that chasm: I am sure it was something strange and terrible. Whatever it be, it has left your mind in a state of doubt. In such a case two heads are better than one. Confide in me." The engineer long endeavoured to evade my inquiries; but as, while he spoke, he helped himself unconsciously out of the brandy-flask to a degree to which he was wholly unaccustomed, for he was a very temperate man, his reserve gradually melted away. He who would keep himself to himself should imitate the dumb animals, and drink water. At last he said, "I will tell you all. When the cage stopped, I found myself on a ridge of rock; and below me, the chasm, taking a slanting direction, shot down to a considerable depth, the darkness of which my lamp could not have penetrated. But through it, to my infinite surprise, streamed upward a steady brilliant light. Could it be any volcanic fire? In that case, surely I should have felt the heat. Still, if on this there was doubt, it was of the utmost importance to our common safety to clear it up. I examined the sides of the descent, and found that I could venture to trust myself to the irregular projection of ledges, at least for some way. I left the cage and clambered down. As I drew nearer and nearer to the light, the chasm became wider, and at last I saw, to my unspeakable amaze, a broad level road at the bottom of the abyss, illumined as far as the eye could reach by what seemed artificial gas-lamps placed at regular intervals, as in the thoroughfare of a great city; and I heard confusedly at a distance a hum as of human voices. I know, of course, that no rival miners are at work in this district. Whose could be those voices? What human hands could have levelled that road and marshalled those lamps?" "The superstitious belief, common to miners, that gnomes or fiends dwell within the bowels of the earth, began to seize me. I shuddered at the thought of descending further and braving the inhabitants of this nether valley. Nor indeed could I have done so without ropes, as from the spot I had reached to the bottom of the chasm the sides of the rock sank down abrupt, smooth, and sheer. I retraced my steps with some difficulty. Now I have told you all." "A trusty companion halves the journey and doubles the courage. I will go with you. We will provide ourselves with ropes of suitable length and strength--and--pardon me--you must not drink more to-night, our hands and feet must be steady and firm tomorrow."